I first came across her blog when I was looking for a crochet pattern. I have been a regular follower since then. Her quilting and sewing are something which has inspired me a lot to take up quilting and stitching. Its my pleasure to introduce her to all the Craftziners. Thanks alot Nima, I must say you have been great in responding to my mail. 1.Can you share with us a bit about your passion for Quilting, Crochet and Needlework, your self and how it got started? I learned to do hand embroidery and cross-stitch from my mom, when I was 8 years old. It was on a handkerchief corner, few simple lazy daisy flowers and leaves. Later I tried hand embroidery on pillows, cushion cover etc. When I was in grade 4, I represented my school for district level craft competition. I got my first sewing machine, a manual singer machine from my dad when I was in grade 6. After that, I tried small long stitch kits by anchor that was available in India at that time. I got diverted to music during my teenage years. Moreover, I was studying for my B. Tech in computers…and so my needlework passion was inactive for few years..
After marriage, like some of the Indian women, I stayed home without looking for a career. My husband was fascinated by a cross-stitch bookmark I made for him for Valentine’s Day…and he encouraged me to do more. Cross-stitch is my all time passion, and I love Hardanger too. I learned crochet by myself and am now in the process of learning to quilt. I tried to learn shuttle tatting and knitting but they are not my passion yet. It’s my passion and would love to take it as a serious business in future. a. What do you do with all the works that you make? Most of the stuff i make , i give it away as gifts and for charity fundraising. At times i sell few stuff if i get some custom orders. 3. Do you have any favorites in the crafts that you have made? There are many favorites in my crafty finishes…from a small flower i stitch on a nappy corner to big wall hangings are in my favorite list. to list a few i’m proud of …. 1.My cross stitched quilted wall hanging , it is my one of the biggest project where i combined 2 crafts together. 3. My crochet strawberry pattern and earring pattern. 4. What type of art do you like to make more of? 5. How did you come up with the brand name Made to Treasure? I take classes for my friends and girls . It’s not a serious business yet…just that they are fascinated and come to my house to learn…. 1. my no.2 steel hook for crocheting doilies. 2. Qsnap for my cross stitch and hardanger. 3. self healing mat, rotary cutter and rulers for quilting. I enjoy the process of perfect finishing. My urge to do something new every day. 11. What are your future plans for your blog? I love to communicate to the world thru my blog. to interact with the like minded crafty people. if i’m starting a business i’ll host another site for it. 12. If you had no financial or time constraints, what dream project would you like to work on? 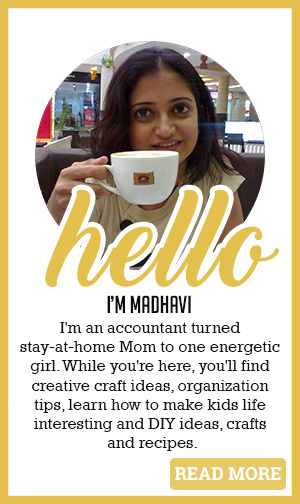 Madhavi, thank you so much for featuring me …. Great work. Thanks for sharing Nima’s work. Hi…First time here. Thanks for sharing such an interesting website. Interesting. All the best Nima. Loved carnations earing. Thanks for sharing such a fine artist. Wow! What a talented artist!! Hi NIma, Loved your interview. Your Passion for art is inspiring. your works are awesome and creative and your works are inspiring,….